Here's an EDF mech I was working on. Originally it had a yellow visor but I realized it looked too much like Halo. Currently, I'm not satisfied with the way it looks. Not sure if it's the color or if I need more detail to make it more Duke 3d styled. Thoughts? I envision it as either an ally that can help Duke or even an enemy if it's controlled by bad guys. have you thought about playing the soldier? maybe with all Duke animations. with EDF npc, modder can recreate a NPC that attacking alien in some game. Okay, WOW. I'm assuming there are more sprites on the way for this? Yes, at one point I was trying to extract the 3d model, but it wasn't rigged (didn't have a 3d skeleton to manipulate) from what I remember and I'm terrible at rigging. 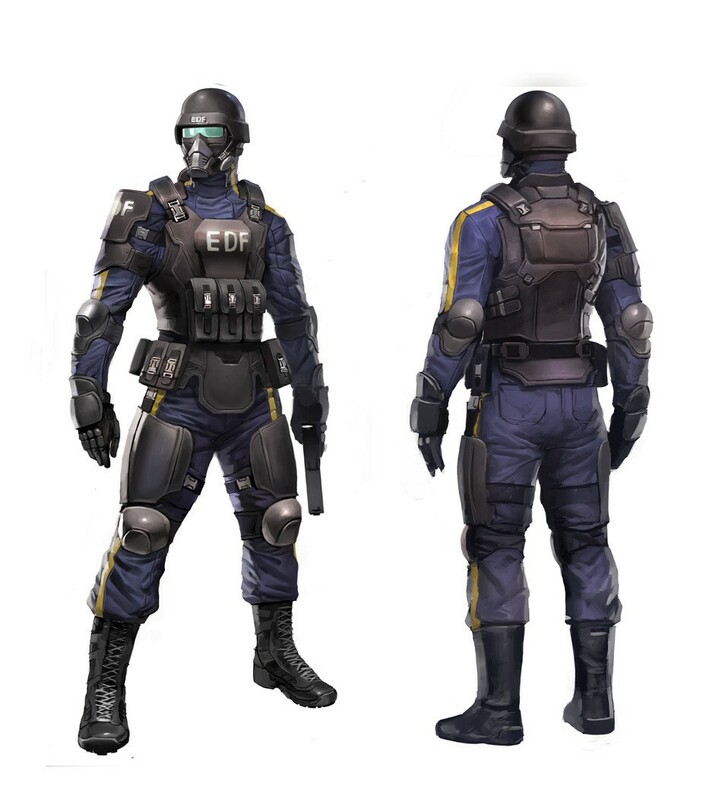 But I might find another way after I finish off the EDF mech, some other concepts and Bombshell. Yes, but not too many. The standard walking and firing. There's a note on the art saying the rockets can fire so it has an alt fire where the shoulder rockets rotate down. There's inactive/shutdown sprite when it's not operational. I'm thinking of dimming the red visor for that. And for the death sprite, I just have a husk. Should I include anything else? I think a stomp or melee attack would be useful as well. I actually tried to recreate those EDF soldiers with a really crappy sprite edit in the AMC TC, if you manage to find a way to rig them up that would be awesome as I could just drop them in right on top of what's there. Yeah, I'm thinking a tazer kind of attack. BTW, I did a few more changes to the look and I'm now more satisfied with the EDF Mech. My only regret about those enemies is that I can only upvote your post once. Having the sniper alien, in addition to looking amazing, has the potential to add some new gameplay. There could be areas where Duke actually has to use cover, and get into a sniper battle with them. I'm guessing the female ninja from Shadow Warrior is where the "assets" of the female alien came from? And like Trooper Dan, I regret that I can only upvote your brilliance once. I salute your excellent work, and I salute you! Thanks guys. Actually I didn't look at the Shadow Warrior female ninja when making the female alien, but I can see why they are very similar. Personally I think the female ninja is poorly modeled IMHO. we have already seen in zero Hour where Some enforcer used Sniper Rifle. I almost don't want to say anything because no amount of praise and admiration would ever be enough. My first pass at the EDF mech. Personally I think the female ninja is poorly modeled IMHO. I still believe they just recycled the work made for the old Lara sprite as a hasty addition to not waste 3d work. Though the demo version of lara croft looks better IMO. Edit: Nevermind, I read that wrong. Yeah, the low polygon look is pretty obvious. You know what might be a good pigcop vehicle.A pigcop on a motorcycle. Wow, not since David G. (aka. 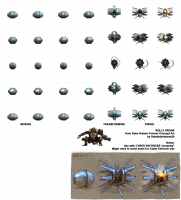 ItsNatureToDie) on the Zdoom forums have I seen one person pump out so many high quality spritesets in such a short time. The female sniper alien is my favourite so far. It's so good you almost can't tell what it's based on. Your version of the boss hog looks much better than jet-nick's (no offense), please continue if you can still think of a way to improve on it! Also, wow, I just saw the minigun pig. I think I may have a new favourite. I also had an idea that I need some comments on. I was thinking about making a scary slime monster than hangs out around those green slime areas with slimers, eggs, and babes. I thought it would be cool to have a walking slime monster (not necessarily biped) that can camouflage/morph into the pods that babes are usually in. Any ideas for shapes or forms? Off the top of my head, I imagine a fasting walking slime monster that looks like Hedorah that melee attacks. you can create something with tentacle and slime. I picture this nasty creature to be lurking around slimed dark areas. It can spit acid at you or devour you up close. It can also camouflage into pods for babes. I think it would also be neat if its eyes can glow in the dark. So far I'm just going to name it "Slime monster" unless someone else can think of something better. I also had to upscale the resolution since it morphs into the pods. Not sure if that would affect the overall size of the enemy when roaming/attacking. Maybe you can "rationalize" the transformation making the cocoon parasite exploit the body of those who have trapped as a base to transform themselves in that anthropomorphous slime creature, a bit like the xenomorphs. I don't remember any podded women turning into protector drones and I just played through the entire game last week. It's not cruelty. They even say "kill me" when you try to interact with them. The idea is definitely that you're doing them a favour. The "Kill me" thing was an Alien reference. Of course, this was changed for Duke Nukem 64 where you HAD to rescue them---and before that, the FEMCON mod allowed you to rescue the babes, which led to similar mechanics in later mods like Nuclear Showdown and (most recently) The AMC TC. I could go on a whole spiel about how I prefer to save the babes, and such, but that's a story for another thread. BOT: sebabdukeboss20, the Slime Monster looks brilliant. Will there be sprites to view it from more angles than just the frontal view? Of course! This was just an initial rendering to get comments/suggestions. I made it look a little more creepy (the eyes) and detailed now with all angles. I decided to give its under belly my slimer variant teeth to look extra nasty. It is related to the slimer after all (I think). Another thought. Maybe the pod left over from a killed cocooned babe could randomly morph into one of these. Of course! This was just an initial rendering to get comments/suggestions. I made it look a little more creepy (the eyes) and detailed now with all angles. I decided to give it's under belly my slimer variant teeth to look extra nasty. It is related to the slimer after all (I think). NICE. Every new sprite sheet you've done is just brilliant, and leaves me in suspense for whatever masterpiece you've got coming next. The "Kill me" thing was an Alien reference. That doesn't denote mutual exclusivity. It can be a reference and a pathos device at the same time. Of course, this was changed for Duke Nukem 64 where you HAD to rescue them---and before that, the FEMCON mod allowed you to rescue the babes, which led to similar mechanics in later mods like Nuclear Showdown and (most recently) The AMC TC. Mods and enforced censored game variations that weren't made by the original team doesn't change anything. Which is why you also can't save the cocooned babes in DNF. The official lore is, if you're a babe and you're cocooned, you're as good as dead. I could go on a whole spiel about how I prefer to save the babes, and such, but that's a story for another thread. So do I. I love Duke64 in almost every way. Again, it doesn't change anything with regards to the lore. True.....but you have to ask yourself one question. If Duke is such a hit with the ladies, would they still respect him even if he pretty much admitted that he had to leave behind (and/or occasionally kill, accidentally or otherwise) the enslaved babes aboard the alien spaceships? Not trying to bash you or disrespect your opinion---you have the right to your opinion just as I have the right to mine, and I'm perfectly okay with that---but it's just something to ponder. Duke doesn't have lore, it's just seat of the pants stuff that fits whatever game they're making. I doubt they put any thought into the babes beyond the B-movie aspect and the aliens reference. Yes. I'm sure everyone understands that if someone has been captured and is biologically un-saveable then that's not the hero's fault. I don't think that's anything to ponder. I mean, yes, there's not much depth to Duke. Everything was made for game design and interactivity (like all games should be). That doesn't alter the fact that they decided to throw in cocooned women who can't be saved. They were absolutely going for a horror vibe there. B-movie or no. Parody or no. Duke3D was downright frightening at times. It wasn't all comedy and laughs. This is why I think the notion of people calling the new Duke Nukem movie an "action comedy" is ridiculous.